Pen Chalet: 5 Common Fountain Pen Pitfalls and How to Avoid Them! ACME Studio salutes Chick Corea, Stanley Clarke, John McLaughlin and Lenny White with some very cool pens. Yesterday was the first day of the very first World Watercolor Month. It might not be on your calendar, but don’t let that stop the celebration. Angela Fehr sent an invitation to participate and I’m game. Check out Doodlewash for inspiration and use the #worldwatercolormonth hashtag when you post your watercolor sketches. If you are new to watercolor painting, Angela has a YouTube channel that can help you get started. Her style is to let the paint do the talking without using pen or pencil to draw a scene first. It’s very loose and exciting to see the colors mix together on the paper. Another method is to draw a subject and use paint to fill in the color. It reminds me of a coloring book and works very well in a journal. Teoh is an urban sketcher who does it that way. Want to give it a go? All that’s needed is paint, brush, a container for water, and of course water. Here are some products from Amazon.com to get you started. Winsor & Newton Cotman Water Color Pocket PLUS Set of 12 Half Pans – Student grade paint in a box with plenty of mixing space. Comes with a small brush. 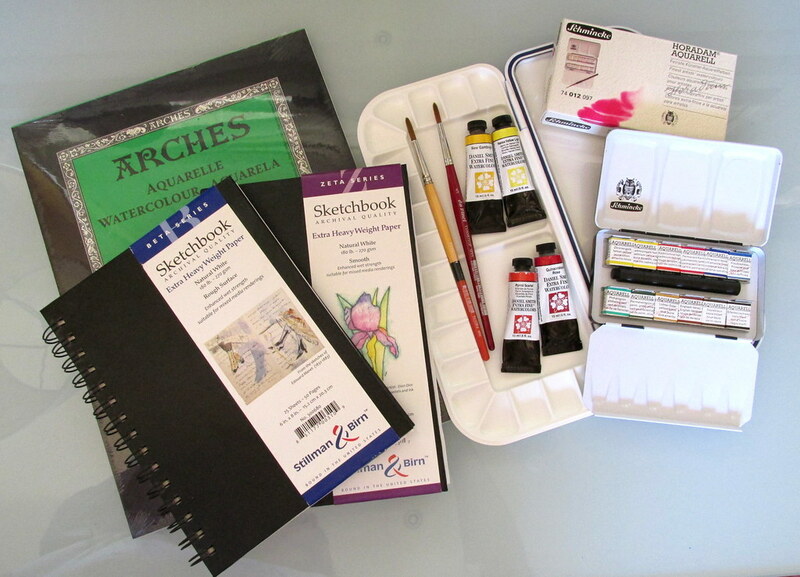 SCHMINCKE Half Pan Watercolor Pocket Set (74012097) – Artist grade paint in a sturdy metal box. Comes with a very good Da Vinci #5 travel brush. Daniel Smith 285610005 Extra Fine Essentials Introductory Watercolor, 6 Tubes, 5ml – Mix your own with this set of basics designed to produce clean, clear colors. Martin Mijello Airtight Watercolor 18-Well Blue Palette – A good container for the Daniel Smith tube paints. DaVinci Cosmotop Spin Watercolor Brush Round Size 8 – No single brush will do it all, but a size 8 is a versatile choice. Princeton Snap! Brush (Set of 3) – These are larger brushes, but the Snap line offers very good control. Use them at different angles for a variety of stroke widths. Arches Cold Press Watercolor Pad, 9″X12″– Arches is the brand most often mentioned as a favorite. Cold press refers to the production process and denotes a paper than has some texture. 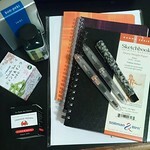 Stillman & Birn Zeta Series – Journals with smooth paper that handle watercolor as well as markers and fountain pens. Stillman & Birn Beta Series – Journals with cold press paper for mix media including watercolor. Winsor & Newton Cotman Water Color Travel Bag – The whole kit and caboodle in one place. If you want to minimize your investment, Cotman is as good as it gets for student grade paint and it is much better than the stuff sold for kids. Student grade can have more fillers and be less lightfast than artist grade, but it’s good enough to get acquainted with watercolor painting. The box can be refilled with artist grade colors as needed. Just as important as the paint is the quality of the paper. Crummy paper will yield unsatisfactory results even with top quality paint. Buy the best you can or you may never know how much fun painting can be. For a newbie, a synthetic brush can offer more control than natural hair and provide a good transition from writing and drawing to painting with watercolor. If you are only investing in one brush, buy one with a good point for lines and details. You can always paint with the side of the brush when more coverage is needed. So there you go. World Watercolor Month and the few tools needed to participate. Are you on board?